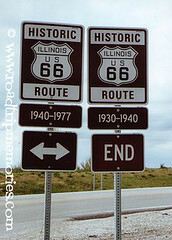 « The eve of a new Route 66 trip! After Jennifer got back Saturday morning from the airport, we met at her apartment in Romeoville to begin our weekend excursion. The plan was to take 55 to St. Louis, and 66 in Missouri. After a “grab & go” at Burger King for breakfast, our first stop Saturday morning was Funk’s Grove. We had the chance to talk with Debby Funk and pick up some sirup, maple candy and a few other trinkets. Jennifer never had their sirup before. On her first trip last August with Amber, they were closed for the season. We found out from Debby that during that season, they had less sirup than normal, only 800 gallons. They usually yield about 1500 gallons for a season. This year, they have 2500 gallons, 1000 more than usual! So anyone who would like some Funks Grove Maple Sirup should be able to get some this year! Jennifer and I both bought some, and some Route 66 souvenirs, maple candy, and Jennifer bought some maple cream too (delicious!). We left and headed for Henry’s Old Route 66 Emporium to buy some more souvenirs, however, t hey were closed. After we left Staunton, we called Shellee Graham to see if she could meet us at Ted Drewe’s. After we got the big “thumbs up” from Shellee, we arrived shortly after 1:30 and ordered two concretes while we waited for her arrival. 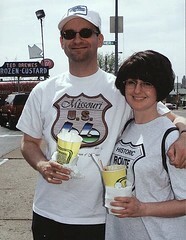 It was an ideal day for frozen custard, as it was sunny and warm and in the low 80’s in St. Louis. After discussing everything from Corvair alternators to dim bulbs to Jim’s new book to Becky’s message in the Texas newsletter, we hated to part, but we said our goodbyes and Jennifer & I started west on 66 around 2:45. Before we left, Shellee kindly took a photograph for us! We made a stop at the Route 66 State Park in Eureka and drove around the grounds & tried to imagine where all the homes once stood. It was a gorgeous day and place for a picnic lunch (too bad we hadn’t brought one! )…so there’s a new “next time” for our list. Leaving the park, we ventured through Pacific past Monroe’s Route 66 diner (where Jennifer and Amber had breakfast on their August trip – simply fabulous!!). They were closed for the day, but we were hoping they’d be opened the next day (iffy since it was Easter). We went through Gray Summit (I refrained from throwing any objects at the Gardenway Motel as we passed), St. Clair, and into Stanton, where we stopped at the Antique Toy Museum. Since Jennifer had bought me a Dixie Trucker’s Home t-shirt earlier in the day, I felt compelled to return the favor. So, at the Toy Museum, they had some 66 t-shirts with “The Route America Travels” on it. Looks like the image of an old decal. So I bought one for her and myself, and a couple of cold Route 66 Root Beers for the road. From there, we made our way toward Rolla. Since it was after 5:30 at this point, Route 66 Motors and the Mule Trading Post were both closed for the day. However, the Totem Pole Trading Post on the west side of Rolla was open, so we found more souvenirs to buy. On the outskirts of Rolla, “Wolfman’s” had the open sign on, so we decided to stop. After the proprietor (Jim) saw our car pull into the lot, he made his way from his house next door to let us in. We wished we’d kept driving! If you like second-hand cameras, 8-track tapes, and Dale Earnhardt souvenirs, this place is for you! Jennifer bought a $2 ($2!!?) Route 66 ink pen…….a charitable effort on her part! From there, we made our way to John’s Modern Cabins. (As a side note, I collect old Route 66 postcards of structures that I know are still standing, and I try to recreate those same photos as the buildings look today….from the same spot the postcard photographer took them. And one postcard I have is of Vernelle’s Motel. So I had to get a shot of Vernelle’s while we were at John’s Modern Cabins.) Upon arriving at John’s, we noticed that the Burma Shave-esque signs which Ron Warnick and Emily Priddy put up on the edge of 66 in front of the cabins, needed some attention. Two of the four were still standing, but one of the signs had fallen off the stake, and another one of the stakes had been split in two pieces. Someone had tried to fix it with duct tape, but it was sagging badly. So it was Jennifer’s quest to right this wrong and fix the signs. And since I had a toolbox in my trunk, I got to play Mr. Fix-It. So we scoured the area around the cabins for anything that had nails we could use. We found some loose boards that had straight nails, so I yanked them out with a pair of pliers and used them on the signs. After securing them as best we could, we hammered them (didn’t even use a hammer!) back into the ground. So hopefully our handy-work will last long enough for you all to see the next time you’re through Missouri. After our contribution to the Mother Road was finished, we walked east with my camera to Vernelle’s. It’s amazing how the place had changed (buildings razed, buildings moved) since the picture of the postcard was taken in the late 1950’s. Since it was past 7pm, I tried to convince Jennifer we should stay there for the evening, but all she did was mention the Jerry McClanahan Suite and the next thing I knew, we were on the road towards Devil’s Elbow. Since Jennifer had missed the turnoff to Devil’s Elbow on her trip in August, I had to take her there to show her the sights. We passed the Elbow Inn (the Hawgs were there in full force! ), crossed the old bridge, and saw Allman’s Market. We went up to the area where you can pull off and we looked south down into the “valley” where the trains cross the old iron bridge. At this point, I said to Jennifer “It’s so quiet here”. And before I finished getting “here” out of my mouth, a shotgun blast up the road came out of nowhere and echoed endlessly! After a few more shots, we both decided we didn’t want to be someone’s supper, so we got back in the car and left. Talk about timing, eh?? Arriving in St. Robert for fuel, we discussed where we wanted to spend the night. I lobbied hard for another 30 miles west to the Munger Moss, but since Jennifer had been up since before 5am that morning, we decided to head back to Rolla for the night so Sunday’s drive wouldn’t have to be so long. Since we’re both “mom & pop motel” types, we thought we’d choose from a few on Martin Spring Drive. Since I had taken a picture earlier in the day of the Wayfarer Inn (I had an old postcard of it), we thought it looked like a decent place to stay. Neither of us thought checking into a motel was such a chore! The “new help” behind the counter had difficulty using Jennifer’s card on the credit card machine. After “New Help’s” 6th or 7th attempt, a man (presumably the owner), ) came from the back to see what the problem was. He told “New Help” she wasn’t entering all the numbers, so after the 8th attempt, the credit card machine spit out another error message. He again told “New Help” she hadn’t entered it right…..so attempt number nine had the same results as the previous eight. At this point, this comedy duo were too much for Jennifer and she came down with a case of “I’m trying like heck to hide my laughter”. Well, at this point, Jennifer was able to compose herself long enough to say she’d pay in cash. Meanwhile, the comedy duo were still doing their fine routine. Jennifer couldn’t take anymore, in spite of desperately trying to conceal her laughter (which NEVER works), and she mentioned something about having to get something in the car. So I took care of the bill, and when I got to the car, Jennifer’s ailment turned into a full-fledged case of “I can’t hide my laughter”. Well, upon entering our room (#118 for those of you playing at home), we both decided sometimes it just doesn’t pay to support mom & pop! The room was less than appealing, as the interior door was missing paint, the curtains wouldn’t open as they were nailed to the wall, there were all of 2 lights in the room. The bathroom door shut too tight, you had to force it in with your shoulder to open it from the outside (and Jennifer nearly dislocated her shoulder trying to pull it open from the inside). The bathroom was old-looking, which is NOT always a flaw in older places…however, this place had strange caulking all over, mold on the tile floor, the toilet ran on and off all night, and to get it to flush, you had to keep holding down on the handle until all of the water came out of the tank. Niiiiiiiice! We then called it a night, but that isn’t the end of the Wayfarer Inn story. This entry was posted by Jennifer on April 14, 2001 at 12:39 pm, and is filed under Road Trips. Follow any responses to this post through RSS 2.0.You can leave a response or trackback from your own site.